Get ready this August, the launch of Juicy Couture's new line Bird by Juicy Couture. It' is pricier than the original Juicy Couture label. Bird consists of sophisticated, fitted pieces inspired by timeless, vintage silhouettes. Casual luxury. I, personally, yawned (double yawned, loudly) at the fall collection. Nothing special. I think I like the Couture Couture line better. Introducing a clothing line by a fall collection is the biggest mistake. Summer clothes say a lot about designer's style and taste! Who knows, maybe next season, would be a heart stopper. 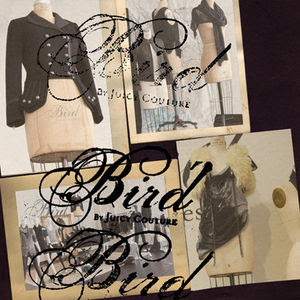 Bird's fall collection is available in select Juicy Couture stores, Juicycouture.com, Bergdorf Goodman, Maxfield's, net-a-porter.com (some items already sold out! ), Harrods, Holt Renfrew and other high-end retail and specialty retail shops.